A $12,000 grant from the Bosch Community Fund will fund a pilot research program for Williams Baptist University science students. The Bosch Company, which operates a plant in Walnut Ridge, is providing the grant to stimulate interest in STEM (Science, Technology, Engineering and Math) fields. 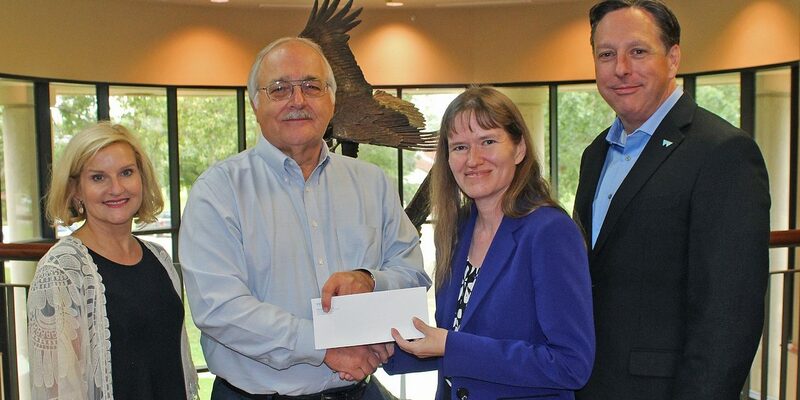 Steve Engelken, operations manager, and Tracy Brock, human resources manager at the Walnut Ridge Bosch facility, recently presented the grant to Dr. Stan Norman, president of WBU, and Dr. Ann Paterson, Nell Mondy Chair of Natural Sciences and professor of biology at Williams. Biology is the most popular major at WBU, and the grant will be used to launch a collaborative research program in marine conservation. Williams students selected for the program will participate in preparatory activities and study during the academic year and will then accompany two faculty members to Titusville, Fla., in May. Once in Florida, they will spend one month conducting research projects in marine conservation and performing community service to improve environmental quality in their work area. “Thanks to this generous gift from Bosch, we are going to be able to pilot a program that will give our students an opportunity to participate in marine biology research, with the possibility of publishing well-done projects and presenting them at scientific conferences,” said Paterson. “We also hope that their presentations on their work locally will inspire others in the community, such as K12 students, about the exciting opportunities available in STEM fields. We want them to see how much fun working in STEM fields can be, and to open new horizons for students who may have never considered these types of careers before,” she added. The WBU team will work in conjunction with Dr. Robert Sluka of A Rocha, USA, which is based in Titusville. Paterson said WBU will commence with the project this fall.